Florence Gibson's "Belle" returns to the Factory Theatre for a remount as a co-production with the National Arts Centre. Winner of the 2001 Chalmers Award, this is a play written in a wonderfully poetic language that makes you glad that not all playwrights have banished verbal richness from the stage. It is filled with powerful scenes drawing committed performances from the cast, largely unchanged from last year. Sad to say, the play is also flawed. It carries its ideas out in the open using rather too many speeches to hammer them home. The plot involves a barely credible character and is over-reliant on coincidence. The story is one of hope, disappointment, betrayal, loss and hope renewed. The action takes place during the Reconstruction Era, from the passing in 1865 of the 13th Amendment abolishing slavery to 1870 when, after a backlash arose restricting the freedom of black people, the 15th Amendment "Rights Not to Be Denied on Account of Race" was passed. Against the backdrop of this turbulent period, we meet the freed slaves Belle and her husband Bowlyn, who move out of Georgia with their baby to the North seeking a better life. They eke out a living, Belle washing floors, Bowlyn driving a taxi, when their paths cross those of two white refugees from the South, Lackey, a hanger-on of the Republican party, and Nance, a suffragette. Nance's activities manage to lose both Bowlyn and Belle their jobs in separate incidents. To make up to the couple, Nance decides to enlist them in a campaign for universal suffrage, for women and for blacks. 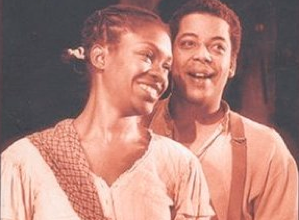 Bowlyn betrays his ideals and Belle when he is seduced by Nance and later supports the "Universal Manhood Suffrage" plank supported by Lackey. The unity Belle and Bowlyn had known in the South has now been shattered and the play moves into melodrama. Gibson, a white Canadian author, was inspired to write this play after reading of "Ain't I a Woman?" by bell hooks [sic], an American black feminist activist, who describes the political machinations of Reconstruction. When Bell and Bowlyn arrive in the North, they become enmeshed in a political struggle between black and white, male and female. Due to the personal ambitions of Lackey and Nance and the complicity of Bowlyn, Belle finds herself betrayed as a black, as a woman and as a wife. To reach this point, the plot, especially in Act 1, relies far too heavily on a series of coincidences involving the unbelievable character Nance. She is rich, unstable woman, supported by her father's money, who tries to banish her own insecurities and anger through campaigning for women's rights. She has also been a lumberjack. She seems so loony when she first appears we assume she is a comic figure; however, by the end we are supposed to believe that women's groups have chosen her as a possible congressional candidate. We are also supposed to believe that Belle and Bowlyn not only tolerate but come to like someone who cost them their jobs and is clearly emotionally unbalanced. The political points Gibson wants to make are important but the means she uses to get there are too contrived. What makes the play exciting are the superb performances of Yanna McIntosh as Belle and Nigel Shawn Williams as Bowlyn. McIntosh proves yet again that she is one of the finest actors of her generation. If Stratford had any sense, she should be working her way through the great female roles in Shakespeare. The intensity and subtlety of her reading combined with immediate connection she established with the audience make Belle a vivid character you feel you know and care about. Her waving a banner at a woman's rally and shouting for rights for black women made me think there should me a Mother Courage in her future. Williams gives an equally fine performance, showing us how intermingled are Bowlyn's virtues and weaknesses. Bowlyn's habit of waxing poetic and is ease at making stirring speeches seems charming at first until we see he is a fantasist unable to face unpleasant realities. Alex Poch-Goldin makes Lackey (whose real name is "Lackley") quite a nasty toady, whose rage at his own insignificance turns to anger against others. Soo Garay has the impossible task of making Nance the suffragette seem credible. She comes close at times, as when Nance has to tell Belle that she can no longer be seen with black women in public, but otherwise the text defeats her. It also doesn't help that she gives the character such a narrow range of expression. Karen Robinson is the only cast member new to the play. As Belle's crazy sister Althea she manages to avoid cliché and suggest a person behind a character Gibson uses primarily as a soothsayer and chorus to the action. Director Ken Gass gives the work excellent pacing, but he plays up the comedy involving Lackey and Nance so much in the early scenes I found it hard to take them seriously, as the text seems to require, later in the play. Julia Tribe's set is best at suggesting the shantytown where Belle and Bowlyn live, but even the wide range of Bonnie Beecher's lighting effect cannot change it into the various elegant setting the play demands. John Gzowski's sound design generally provided clearer clues to location. The play is at its best when Belle, Bowlyn and Althea communicate their feelings in the rhythmic, image-rich language Gibson has devised. It, more than the contrived plot with its underscored messages, conveys a fierce love of life that the divisive political language of the North cannot destroy. To hear such language in the theatre and to experience such powerful performances from McIntosh and Williams are the overriding reasons to see the play. Photo: Yanna McIntosh and Nigel Shawn Williams. ©2002 Cover of Belle, Playwrights Canada Press, 2000.